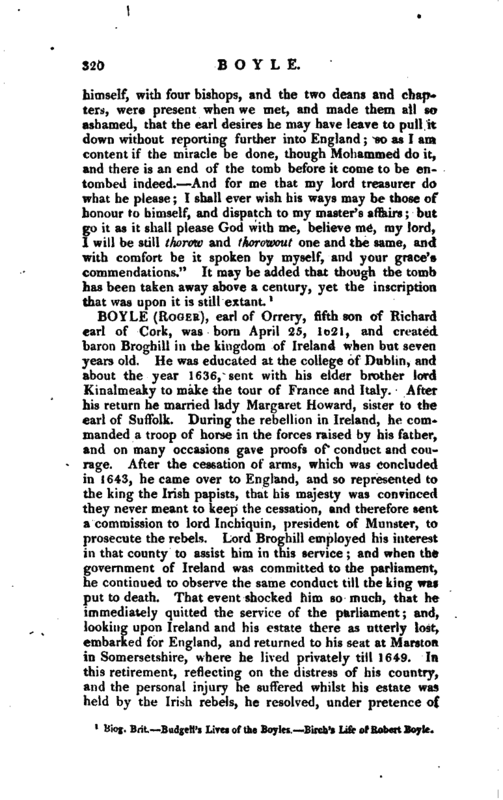 Poor Budgell, who, when he wrote his “Lives of the Boyles,” was out of humour with all mankind, and espeially with ministers of state, says on this early visit, “If we reflect upon the hours our ministers keep at present, we shall be the less surprised to find that our affairs are not managed altogether so successfully as in the days of queen Elizabeth.” Lives, p. 15.
called upon me to attend him to the court, where he presented me to her majesty in her bedchamber.” A journey so rapid as this would be thought, even in the present more improved modes of travelling, requires all his lordship’s authority to render it credible. Sir Walter Raleigh’s estate consisted of twelve thousand acres in the counties of Cork and Watei ford (Cox’s Hist, of Ireland, vol. 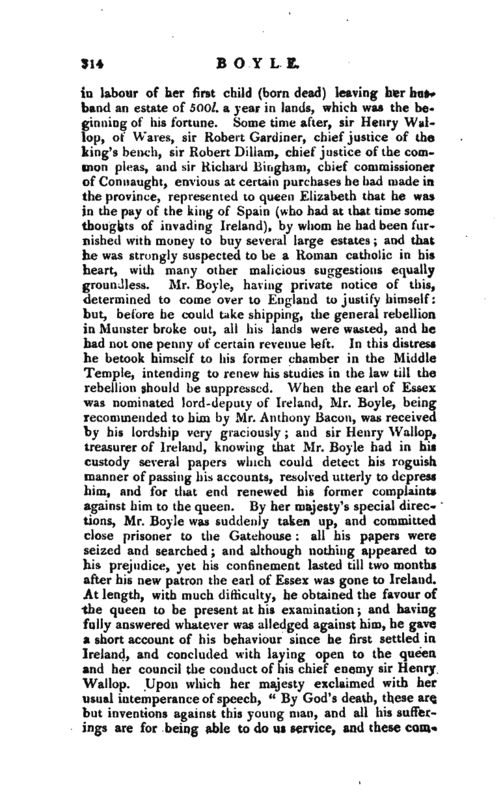 1. p. 35-2), which was’ so much improved in a few years by Mr. Boyle’s diligence, that it was not only well tenanted, but in the most thriving condition of any estate in Ireland. Cox’s History of Ireland, vol. II. Pref. An absurd story is. 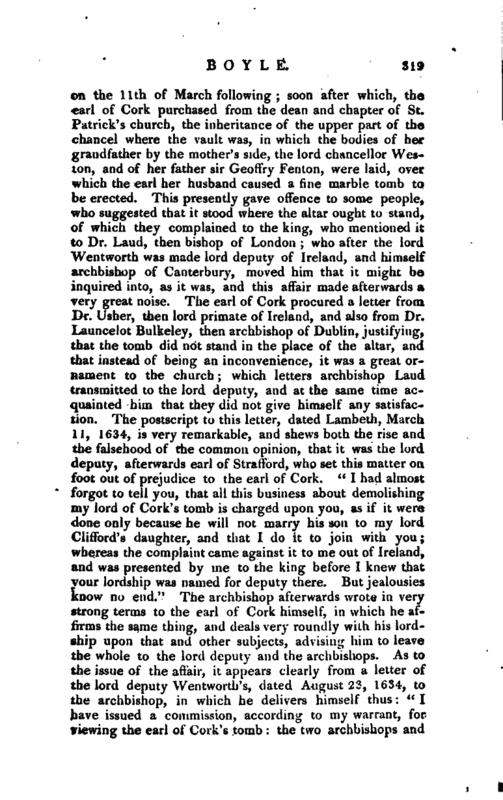 told by Dr. Anthony Walker in his funeral sermon on the countess of Warwick, daughter to our nobleman, that Mr. Boyle happening to call on sir Geoffry Fenton who then was engaged, amused himself with an infant in the nurse’s, arms; and on sir Geoffry’s appearance told him he would be happy to marry her when grown up, Sec. Dr. JJirek has shewn how little foundation Dr. Walker had for this account. 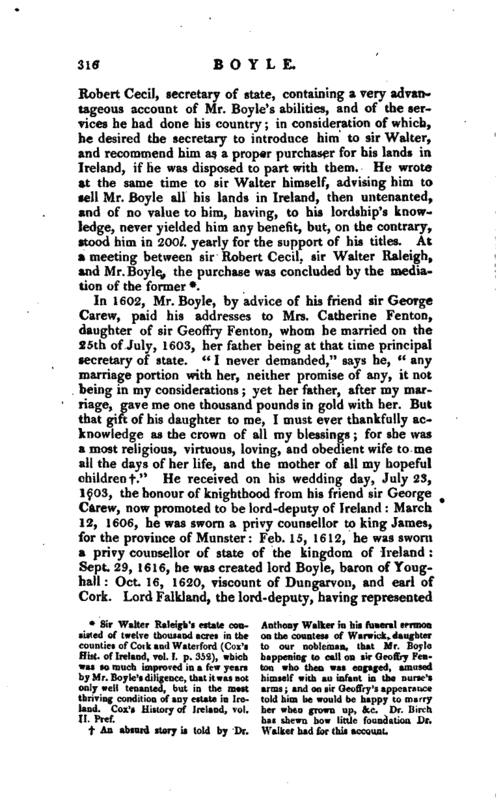 He received on his wedding day, July 23, 1603, the honour of knighthood from his friend sir George Carew, now promoted to be lord-deputy of Ireland: March 12, 1606, he was sworn a privy counsellor to king James, for the province of Munster Feb. 15, 1612, he was sworn a privy counsellor of stete of the kingdom of Ireland Sept. 29, 1616, he was created lord Boyle, baron of Youghall: Oct. 16, 1620, viscount of Dungarvon, and earl of Cork. Lord Falkland, the lord-deputy, having represented | his services in a just light to king Charles I. his majesty sent his excellency a letter, dated Nov. 30, 1627, directing him to confer the honours of baron and viscount upon the earl’s second surviving son Lewis, though he was then only eight years old, by the title of Baron of Bandonbridge, and viscount Boyle of Kinalmeaky in the county of Cork. 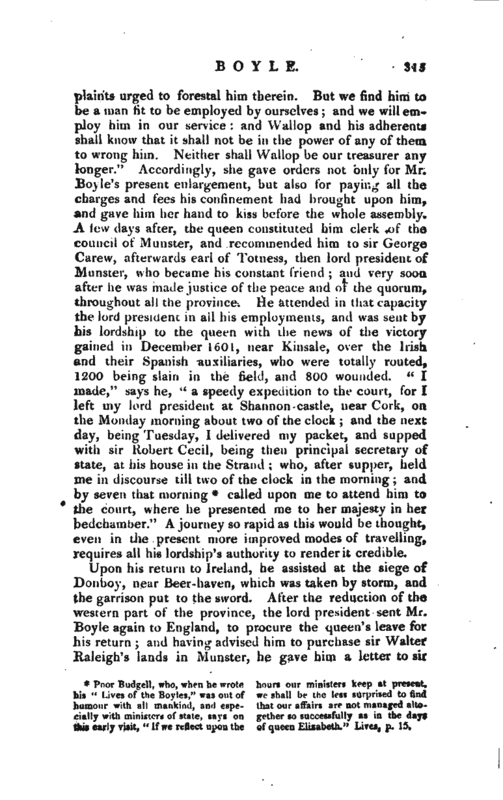 On the departure of lord-deputy Falkland, the earl of Cork, in conjunction with lord Lortus, was appointed one of the lords justices of Ireland, Oct. 26, 1629, and held that office several years. Feb. 16th following, the earl lost his countess, by whom he had fifteen children. Nov. 9 1631, he was constituted lord high treasurer of Ireland, and had interest enough to get that high office made hereditary in his family. 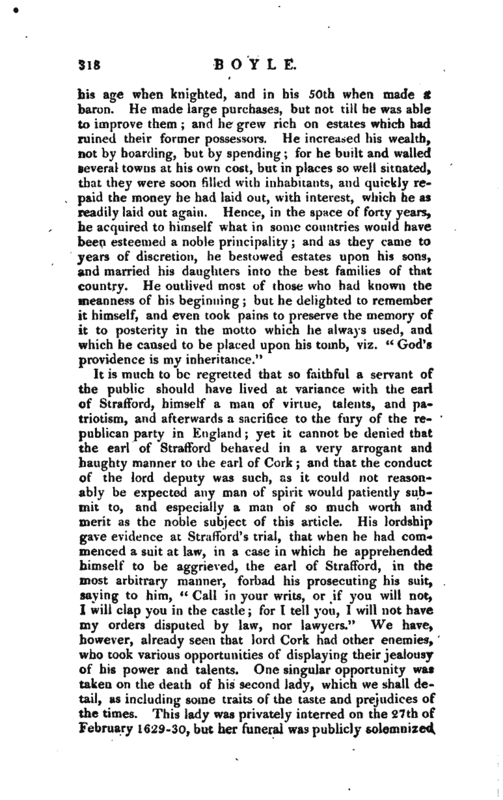 Nevertheless, he suffered many mortifications during the administration of sir Thomas Wentworth, afterwards earl of Strafford, who, before he went to Ireland, had conceived a jealousy of his authority and interest in that kingdom, and now conceived that if he could humble the great earl of Cork, nobody in that country could give him much trouble. 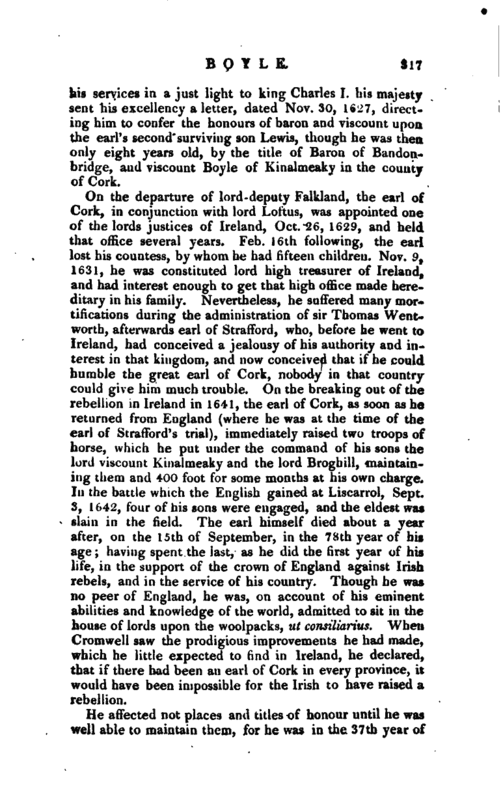 On the breaking out of the rebellion in Ireland in 1641, the earl of Cork, as soon as he returned from England (where he was at the time of the earl of Strafford’s trial), immediately raised two troops of horse, which he put under the command of his sons the lord viscount Kinalmeaky and the lord Brogbill, maintaining them and 400 foot for some months at his own charge. In the battle which the English gained at Liscarrol, Sept. 3, Io42, four of his sons were engaged, and the eldest was slain in the field. The earl himself died about a year after, on the 15th of September, in the 78th year of his age; having spent the last, as he did the first year of his life, in the support of the crown of England against Irish rebels, and in the service of his country. Though he was no peer of England, he was, on account of his eminent abilities and knowledge of the world, admitted to sit in the house of lords upon the woolpacks, ut consiliarius. When Cromwell saw the prodigious improvements he had made, which he little expected to find in Ireland, he declared, that if there had been an earl of Cork in every province, it would have been impossible for the Irish to have raised a rebellion. 1 Biog. Brit. Budgell’s Lives of the Boyles. 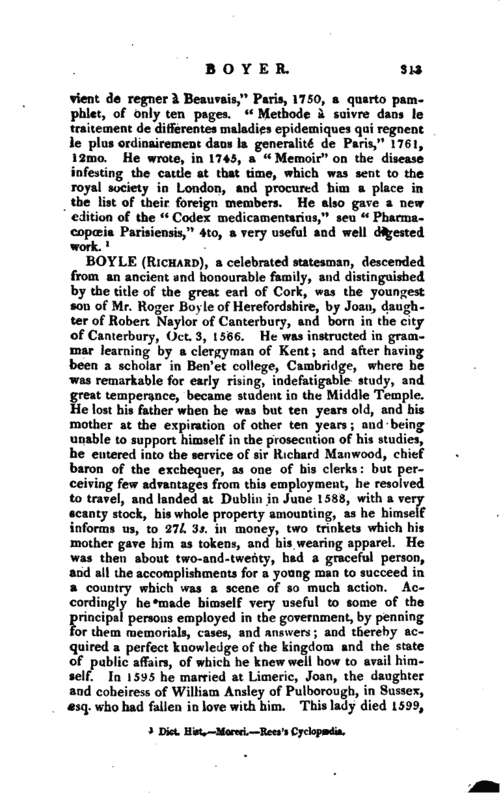 Birch’s Life of Robert Boyle.